In this article various business transactions and tax positions under GST law on the same has been discussed. Following 4 business transactions has been discussed: A. Freebies provided to customers B. Services provided by Employer to Employee C. Taxability of Ocean Freight and D. Supplies made outside India. A popular marketing and sales promotion scheme is providing freebies to customers on purchase of specified quantity of a product. FMCG and Pharmaceutical companies are the prominent industries using this promotional scheme providing freebies to both end consumers and stockists/distributors. Question is that whether freebies having any GST implications either on output side or Input Tax Credit (ITC) reversal on inputs. Whether GST payable under forward charge by supplier on free products sold? As per Sec 7(1) of the CGST Act, 2017 (CGST Act) – supply means any sale, exchange, transfer, barter etc. made or agreed to made for a consideration in the course of furtherance of business. However, supply also includes the activities specified in Schedule I to the CGST Act as supply even if made without consideration. Schedule I of the CGST Act, inter-alia, covers supply of goods or services or both between related persons made in the course or furtherance of business even when no consideration is charged. The Schedule I, however, does not include therein the supply between unrelated parties made without consideration. Customers and company cannot be said to be related persons as per explanation to Sec 15 of the CGST Act. Therefore, it can be concluded that free products provided to customers are not supplies and thus not exigible (chargeable) to GST. Whether any requirement to reverse ITC on inputs used in manufacturing free products? As per section 17(5) of the CGST Act which list down the negative list of supplies not eligible for ITC inter alia states that ITC on goods lost, stolen, destroyed, written off or disposed of by way of gift or free samples is not allowed. So, let’s analyse whether the free supplies qualify to be gift or free samples for the purpose of above clause of Sec 17(5). 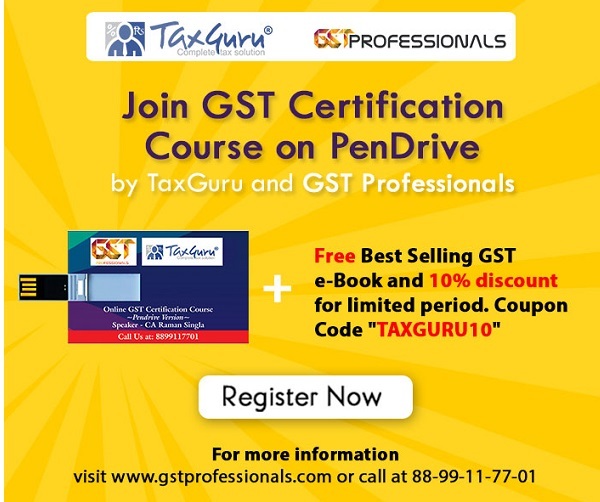 The term “Gift” has not been defined in CGST Act. In common parlance, gift is voluntarily transfer of any property where the transferor is called “Donor” and transferee as “Donee”. The companies providing free products to customers are not gifting the free products to customers but providing free products to promote the sale of their products. Thus, the free products provided are not gifts to customers. Further, free sample means providing sample quantity of a product free of cost which the recipient of sample can use to get to know the product before buying the same for a consideration. Providing free products to customers are not for the customers to use and know the products rather to promote the sales. Therefore, the free supply of products do not qualify as disposal by way of gift or free samples and thus, it can be concluded that even ITC reversal is not required on free products supplied. Whether perquisites provided by employer to employee which may or may not form part of Cost to Company (CTC) are exigible to GST? Section 7 of the Central Goods and Services Tax Act, 2017 (‘CGST Act’) defines supply to include all forms of supply of goods or services or both made or agreed to be made for a consideration by a person in the course or furtherance of business. Further, as per Schedule I to the CGST Act a supply made without consideration is also deemed to be a taxable supply, if it is made between two related parties. As per explanation to sec 15 of the CGST an employer and an employee are deemed as related persons. Proviso to clause 2 to the Schedule I to CGST Act provides that gifts not exceeding INR 50,000/- in a financial year by an employer to an employee shall not be treated as supply of goods or services. The Ministry of Finance (MOF) vide its press release dated July 10, 2017 has clarified that supply by employer to employee in terms of contractual agreement between the employer & employee will not be subjected to GST. MOF while issuing the clarification relied on clause 1 of the Schedule III to the CGST Act which states that services by an employee to the employer in the course of or in relation to his employment is neither a supply of goods nor of services. MOF relying on clause 1 of the Schedule III as above, clarified that supply by the employer to the employee in terms of contractual agreement entered into between the employer and the employee, will not be subjected to GST. It follows that perquisites provided to employees in terms of contract of employment when forming the part of CTC of the employee is not exigible to GST. For Instance: Employer is taking a car on lease from an automobile dealer and providing it to the employee for his personal use. If the said perquisite is not forming part of CTC, then the same is exigible to GST. However, gifts made by employer to employee in excess of INR 50,000 per annum are exigible to GST. To avoid any exposure, the employees can avail the facility directly from the service provider and get the same reimbursed from the company. In such a scenario, the company would not be a supplier of service thus not liable to pay GST on the services provided to its employees by the suppliers directly. Whether company liable to pay GST on notice pay recovery? The employment contract provide for notice pay clauses to ensure that the employees wishing to terminate the employment serve a minimum notice period with company which enables company to fill up the vacant position and transition the work to new employee. Failure on the part of employee to serve the notice period makes employee liable to pay the salary of the period for which notice not served which is termed as notice pay recovery. As per clause 1 to Schedule III, services provided by an employee to the employer in the course of or in relation to his employment is neither a supply of goods nor of services. The recovery from employee on leaving the company serving a short notice period stem from the contract of employment. Therefore, recovery made by employer on premature termination of contract of employment by employee can safely be treated as amounts paid in relation to services provided by employee to employer in the course of employment, thus, not exigible to GST. Similarly, in case of recovery of bond value from employee on his leaving employment before the period agreed in the bond agreement, the bond value recovered from employee is not chargeable to GST. Whether recoveries made from employees towards damage to assets, for lost ID cards etc.? Recovery from employees as such are in nature of penalty. Such recovery is not a consideration towards any supply of service or goods. Infact there is no supply involved in such recovery. Therefore, it can be concluded that no GST payable on such recoveries. Companies importing or exporting the goods through sea route are availing services of shipping companies which are charging a freight as a consideration for transportation of goods through sea route. Whether GST is payable under reverse charge on ocean freight payable to foreign shipping company? Entry at s.no. 10 to the Notification No. 10/2017-IGST dated 28.06.2017 specifying the services on which tax payable under reverse charge mechanism (RCM), states that services supplied by a person located in non- taxable territory by way of transportation of goods by a vessel from a place outside India up to the customs station of clearance in India shall be liable to GST under RCM which will be payable by the service receiver located in India. Further, IGST (CVD/SAD prior to GST) is payable on transaction value adopted for customs purpose which includes ocean freight (when transaction is on CIF basis) which has to be paid with filling of Bill of Entry (BOE) for home consumption. Since IGST is payable while filling BOE on transaction value adopted for customs purpose, levy of IGST on ocean freight under RCM vide Notification No. 10/2017-IGST creating a situation of double taxation i.e. first levy of IGST when value of imported goods includes ocean freight and second levy under RCM. It is worth noting that the validity of the entry no. 10 as stated above of RCM notification has been challenged before the Hon’ble Gujarat High Court by Mohit Minerals Pvt Ltd on the grounds that IGST is already paid on the import of goods on entire value of import which includes ocean freight; hence the tax cannot be collected under RCM. The matter is pending for disposal. Also, in the case of BAHL Paper Mills, the Uttarakhand Authority for Advance Ruling has held that importer is liable to pay IGST on ocean freight on reverse charge basis even if IGST has already been paid on ocean freight component while filling BOE as a part of CIF value of imported goods. Whether services provided outside India to be treated as export of service by default? From perusal of the above definition, it is clear that mere provision of services outside India is not sufficient to qualify it as exports rather all the six conditions stated above must be fulfilled. Further, Sec 7(5) of the IGST Act, inter alia, provides that when the supplier is located in India and the place of supply is outside the transaction shall be treated as supply made in the course of inter-state trade & commerce i.e. inter-sate supply and shall be subject to IGST. It is pertinent to note that under service tax regime the service would go out of tax net when the place of provision of the same is outside India as per Sec 66B of the Finance Act,1994. Going by above, all the transactions where location of service provider is in India and place of supply (place of provision of supply) is outside India is exigible to IGST being an inter-state supply. However, if the six conditions stated in Sec 2(6) are satisfied then the same will be treated as export of service which will be zero -rated supply as per Sec 16 of the IGST Act and not chargeable to IGST provided the exporter has exported executing Letter of Undertaking (LUT) following the procedure stated in Rule 96A of the CGST Rules, 2017. Further, if the exporter fails to execute LUT, then IGST is payable on such supply which, however, can be claimed as refund u/s 54 afterwards. Whether services provided to foreign branches exigible to GST? It follows that supply of services by one unit of a legal entity to other unit which is located outside India cannot be regarded as export of service. Therefore, the same will be chargeable to GST as the same is inter-state supply failed to qualify as export of service. It is pertinent to note that DBS Bank Limited has filed a writ petition in Delhi HC on the levy of IGST on services provided by it to its foreign branches. High court while hearing the petition directed GST council to look into the issue. GST council in its meeting held on 21.07.2018 decided to exempt services provided to a distinct unit of the company located outside India. Notification no. 15/2018-Integrated Tax (Rate) dated 26.07.2018 issued by Central Board of Indirect Taxes & Customs provides that services supplied by an establishment of a person in India to any establishment of that person outside India, which are treated as establishments of distinct persons in accordance with Explanation I in section 8 of the IGST Act” are exempted from GST, provided the place of supply is outside India in accordance with section 13 of IGST Act. Therefore, the services provided by an Indian company to its foreign branches is not an export, thus, taxable, however, specifically exempted by the Notification stated above. This follows that tax not payable on such supplies as the same by virtue of the above notification becomes exempt supply. It is pertinent to note that the same is only an exempt supply and not a zero rated supply. Therefore, such supplies not entitled to export benefits like refund u/s 54 of the CGST Act. Whether sale of goods outside India to be treated as export of goods by default? Sec 2(5) of the IGST Act provides that export of goods means taking goods out of India to a place outside India. This follows that taking out goods outside India is an export in itself and thus, not chargeable to IGST provided made under LUT. Whether transaction will qualify as export of goods if billed to a party in India and shipped to a party outside? Since, export of goods has been defined as taking out goods outside India, the location of Bill -TO party becomes irrelevant as long as long as goods are moving outside India to Ship-TO party located outside India. Therefore, such a transaction is also export of goods. Thanks for reading. Your suggestions and queries are most welcome Author may be contacted at saurabhchokhra92@gmail.com. Disclaimer: The views expressed in the article are personal view of author and should not be taken as legal opinion. Sir, article is goods and satisfactory. Please clarify if foreign company provides me the service of godown outside India for further distribution or sale, and charges rent from me, whether I am liable to pay IGST. Tax not payable as the place of supply in case of services in relation to immovable property is the location of immovable property(godown) that is outside India. Therefore, it is not an import of service as for import of service, place of supply must be India. Since, it is not import of service, tax not payable under reverse charge mechanism. Exemption given under notification 15/2018 IGST(Rate) dated 23.07.2018 on supplied by an establishment of a person in India to any establishment of that person outside India, can be treated as permanent? 1. We are Manpower Outsourcing company and provide manpower to companies/ industries. We charge GST from the Industries on Salary bill (the salary amount we pay to the employees deployed at their premises ) . If we go by the MOF relying on Clause 1 of Schedule III as referred above, WILL IT MEAN THAT GST WILL NOT BE APPLICABLE ON “SALARY & WAGES”, and we shall not charge GST from our client companies/ Industries. 2. Will the Employer Contribution under ESI/PF will be subject to GST and are we suppose to pay GST there on. 1. GST is being charged to service receiving industries which is computed on salaries paid to employees. Thus, it is not the employee salary which is being taxed rather the salaries are forming a basis to calculate the manpower supply company consultancy fee. 2.PF/ESIC payable to employee as a part of CTC, not taable under GST.